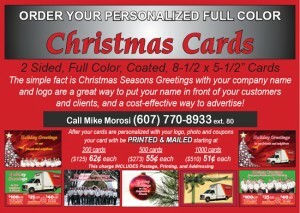 Holiday Cards are a simple, inexpensive, popular, and effective direct marketing tool. They are a form of affinity marketing, meaning that they show the customer that you are in agreement with their sentiments. Other forms of affinity marketing include advertising in church bulletins or playbills and sponsoring community clubs, sports, or charities. All of these forms of advertising build an affinity between you and the customer. When customers believe that you support or share in their causes and interests they are more likely to become loyal customers. Loyal customers are often willing to choose you even if the competition is less expensive because they want to maintain and reciprocate that affinity. 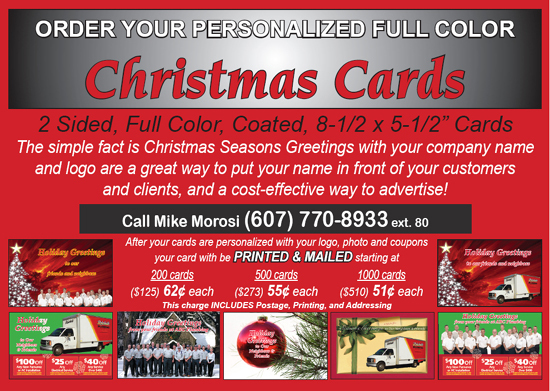 Sending your customers a holiday card not only capitalizes on the sentimentality and good will of the season, but it also makes sure that your name and coupon are easily available during the times of year that electrical, plumbing, or HVAC problems are the most inconvenient and urgent. Contractor 20/20 has a holiday card marketing system that will help you both retain customers and expand your customer base!